Anyone who is scholarly inclined knows how problematic arguments from silence are, and yet people continue to use them. As a scholar (at least I think I am. Some might question that) and as a Christian (at least I think I am. Some might question that), I find it particularly perplexing when I read Christians of various political stripes using arguments from silence in an attempt to force Jesus into being a poster boy for their agendas.We all know how the argument goes-- "Well, Jesus never mentioned (insert issue) so it must not have been important to him. The biggest problem with arguments from silence is that they tell us nothing, only what we wish for them to tell us. I'm going to list the problems with arguments from silence in particular reference to Jesus because it's just one more way we continue to manipulate Jesus making him after our image. In this post I will not be taking positions on any issues nor evaluating them because if I do so, the thrust of this post will be lost because most people are only concerned with the conclusion of the position itself, not the argument that brings one to the conclusion, which I find unfortunate. The argument one makes is just as important, if not more so, then the conclusion itself. First, arguments from silence can be used to draw contradictory conclusions. For example, one can say that Jesus never mentions homosexuality or abortion, the environment, or capital punishment for murder so those issues must not have been important to him. That is one conclusion, to be sure. But someone can also conclude from silence that because Jesus never mentions the issues he must have simply agreed with the Judaism of his day that homosexual practice was immoral and abortion was, in most cases (with some exceptions), prohibited, stewardship of creation was assumed as a duty in Judaism as well as execution for murder. So which one is it, and how can your argument from silence demonstrate which one it is? Second, arguments from silence preference our current context and force Jesus and the Gospel writers to speak to our issues in the way we want them to speak, which usually is an affirmation of our views and not a rejection of them. Thus, we stand in judgment over Jesus instead of putting ourselves under his judgment. Arguments from silence almost treat the gospel writers as if they were speaking directly to us when they were writing. We completely ignore the fact that not only in the Gospels do we have Jesus addressing his contemporaries, but the Gospel writers are using Jesus to address theirs. Neither Jesus nor the Gospel writers had us in mind when they spoke and wrote (a little humbling, isn't it?). Each Gospel writer is telling the story of Jesus in order to speak to the concerns of the communities to which they write. Anyone remotely familiar with scholarship on the Gospels knows this to be true. The image I like to use is that the Gospels are study Bibles with the commentary in the text. Yes, that is rather simplistic, but it makes the point that Matthew, Mark, Luke, and John were telling the story of Jesus in order to directly address specific concerns of particular communities. 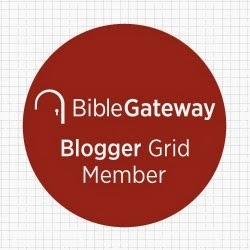 Could it be that there are some issues never mentioned in the Gospels because those issues are not of central interest at the time of their writing in their specific circumstances. We all know that pressing concerns can force other important issues into the background, not because those issues are of lesser concern, but because in that moment in time other matters are more pressing. And it would be a mistake to conclude that certain issues not of pressing character to only four Christian communities throughout the Roman world means that those issues didn't matter at all to the early Christians. That conclusion would also be problematic because that too would be an argument from silence. Third-- and related to the second-- arguments from silence assume that everything Jesus said in the four Gospels is all he ever said. At the end of the Fourth Gospel, the writer states, "But there are also many other things that Jesus did; if every one of them were written down, I suppose that the world itself could not contain the books that would be written" (John 21:25). An intended exaggeration on John's part, to be sure, but the point is well made. During Jesus' three year ministry he said lots of stuff that didn't make it into print. So when someone says Jesus never mentioned something, that is quite a sweeping conclusion. Yes, Jesus never mentioned certain issues of our concern in the Gospels, but that does not mean Jesus never spoke about those issues, We just don't have it in print. Fourth, Jesus failed to mention more than a few issues. Should we conclude that if Jesus didn't mention it, he didn't care about it. Jesus never says anything about human trafficking which unfortunately was a problem in his day too. But since he never speaks about it in the Gospels should we conclude that it was no big deal to him? What about gambling? Alcoholism? Drug abuse? These were problems in the first century world too. Fifth, someone might respond to all of this saying, "Fair enough. But there are plenty of issues Jesus did mention. Shouldn't we focus on them more than what he failed to address?" Well, yes we should attend to those matters Jesus addressed. Jesus was quite concerned about the poor, and therefore Christians dare not neglect them. The problem, however, is that other moral issues we face today are no less important because Jesus did not address them directly. We must not ignore them. To do so is to ignore real people whom God loves and for whom Jesus died. Sixth, arguments that focus exclusively on what Jesus alone said reduces him to a talking head. There are all kinds of things happening in the Gospels that speak to all kinds of things which include Jesus' actions. Some Christians of late treat Jesus as nothing more than a political pundit who has an evening cable news show on Fox News or MSNBC. Jesus must be taken as a whole package-- not just what he said or didn't say. Seventh, to focus so exclusively on Jesus is to neglect the whole canon of Scripture where issues are addressed that Jesus never mentioned. As a Christian I certainly embrace the central authority of Jesus and my hermeneutic does indeed start with the Gospels. But the church has given an entire canon of books that are authoritative. The Old Testament was Jesus' Bible and he quoted from it, and we have no authority to reject what Jesus embraced. And the epistles of the New Testament are in many ways extended commentary on the Gospels, and we have no authority to dismiss them when we do not like what they say. I agree with John Wesley who said that Christians must take into account "the whole tenor of Scripture." I know that is not an easy task. It is complex and sometimes really frustrating dealing with the different voices in the canon. We are right to put Jesus at the head and center of our hermeneutic (by the way it is not always clear in what way Jesus is at the center), but the whole of Scripture assists us as we seek to address the moral issues of our time. We dare not neglect it. Let me say that there is nothing wrong in asking why the silence is there. The problem is when we believe the silence speaks to something that simply isn't there. 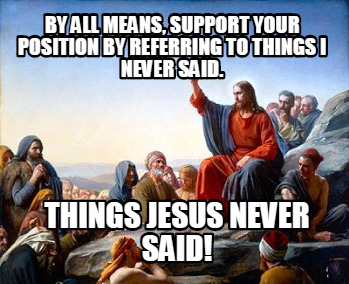 By the way, if your going to use Jesus in support of your argument from silence, I would simply note that Jesus himself never used such an argument in the Gospels. If he did elsewhere, we don't have it in writing. I think Jesus knew that silence was not always golden. Outstanding! I have made some of these points myself, but others never occurred to me. A keeper!